This is a guest post from the wonderful Anahata Giri from One Heart Yoga in Melbourne, on one of her favourite sound practices - Om Chanting. The practice of Continuous Om Chanting is one of my favourite sound practices. The mantra OM is complete, utterly simple, focuses attention and evokes our awakening. Om is an incredibly resonant sound that naturally draws us into its warm, vast, absorbing and embracing sound. Continuous Om Chanting generates and stabilises our prana, cleanses us both physiologically and psychically, clears and steadies the mind, opens the heart and allows us to rest into consciousness itself. There are many ways to chant Om and different traditions will use different approaches. Here is one way. Sit comfortably. We use a full and relaxed yogic breath for this practice. Inhale: allow the abdomen to relax and expand and fill the lower lungs, sides of the rib-cage and upper lungs near the throat. At the start of the exhalation begin with a short AH sound. Then move quickly to the OH sound, which is the longest part of the mantra. Gradually begin closing the mouth and gradually and gently contract the abdominal muscles to slowly resolve the OH sound into MM. Then listen as the MM sound resolves into silence. Feel that each OM returns us to this silence. At the pace of your own full, relaxed breathing, repeat the mantra Om continuously. Om can be repeated just 3 times or chanted continuously for 30 minutes for a deeply meditative practice. Remember to listen to the silence once you have finished chanting - the silence after chanting is just as an important part of the practice as the sound. Practice and detachment are the means to still the mind. Or the True Self may be revealed through surrender to God. 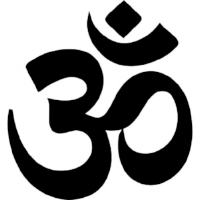 Om is to be repeated constantly, with feeling, realising its full significance. Meditation on God with the repetition of Om removes obstacle to the discovery of the Self.